Getting a work out in with a toddler is easy! And that’s just why we’re sharing this guest post and tips on how to do it — and make it fun — from Andrea Speir, owner of Speir Pilates based in Santa Monica, Cali., and the creator of the Speir Method, which fuses classical Pilates with modern cardio and training methods. Andrea also has three best-selling DVDs, and a digital platform with 12 workout videos called The Pilates Fix. She’s the mama of an 18-month old daughter, Parker Belle, and created the series Fit Pregnancy Plan, an online workout series that offers workouts for each trimester of pregnancy, where Andrea goes through her own pregnancy in real time with this series. For more, check out andreaspeir.com, speirpilates.com or follow Andrea on Instagram @AndreaSpeir. Let’s get real for a second. Working out is hard; there are no two ways around that. Taking that time for yourself takes a mental and emotional commitment that even top trainers struggle with at times. Another fact that isn’t in question is that we always feel better after. That old saying “you never regret a workout” is indeed so true. Now … enter a baby into the equation. I thought that was next-level in finding a way to get my workouts in (and it was), but then that baby turned into a TODDLER. My moses basket is now collecting dust in the corner while my toddler is doing trust falls off the back of the couch. 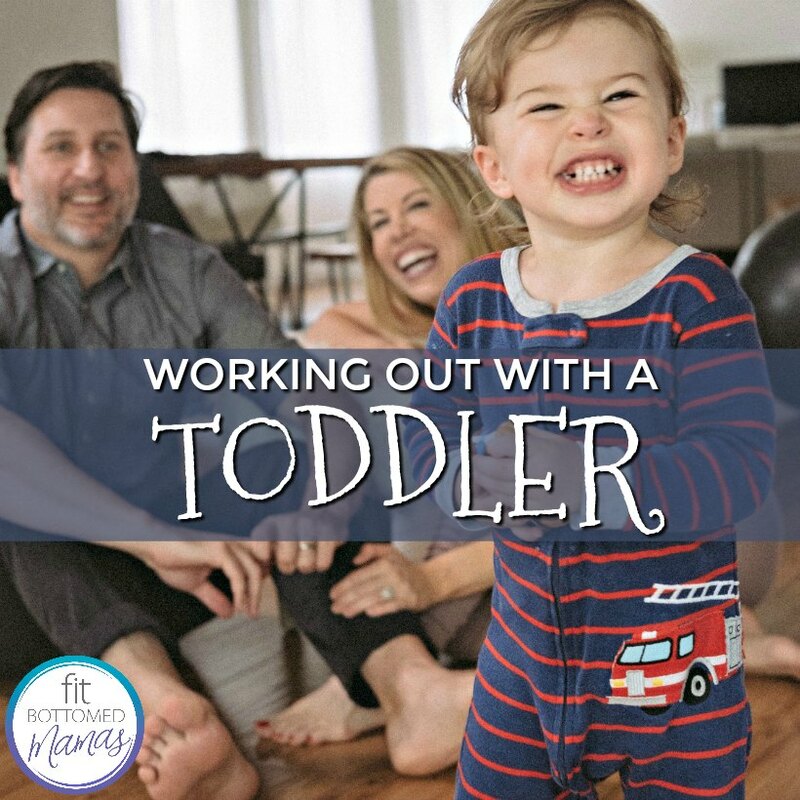 Chasing after a wild toddler is checking off that cardio box, but how do we get our sculpting and toning work in while bonding and engaging with our kid? Around here, we make fitness a kid-friendly game that is all about mommy-and-me playtime. I got you covered with some of the best moves below! Action: Have your toddler sit on your shoulders and hold onto their legs — and possibly also place one hand on the small of their back if you feel a bit insecure. Squat down while deeply engaging core muscles. Stand back up. Why: This exercise is building strength in your glutes, hamstrings and quads. You are also practicing proper core control and strengthening your deep abdominals. Bonus? This is the most fun game ever for your kiddo. Repeat for as long as you are both having fun! Action: Set a big toy at two to three spots in the backyard (on opposite ends). Run from one spot to your toddler. Get a high five. Have them run to the other spot. Why: Not only is this getting your hit of cardio into your workout by spiking your heart rate, it is hilarious to your child and so much fun. You both get fresh air and vitamin D, and you both get to engage in a focused game. Action: Sit with knees bent and feet hip distance apart and flat. Hold your toddler by the waist on your knees. Round back to your shoulder tips (bringing your baby with you). Curl back up and reach your kiddo up to the sky and back down. Why: This exercise challenges the postural muscles and the deep transverse abs, and is often done in personal training with a weight. Well, now you have the most fun weight ever, and this weight gets to go up and down in the air with their bestie, Mama. It’s a win-win. Repeat as long as you are both having fun! Action: Place some toys near each other on the carpet inside. See if you can both jump from one toy to the next! Why: Jumping up and down activates the fast twitch muscles of the body, spikes the heart rate, and strengthens the lower body. This is also a fun game for a toddler, and helps them to engage with Mama and think of physical ways of playing. Action: Put your toddler on your back like a backpack and have them hold on around your neck with their hands and your waist with their legs. Come onto your hands and knees, then shift your weight forward and lift your heels up for a modified push-up. Bend your elbows and lower upper body down. Press back up. Repeat! Why: This is a fantastic way to strengthen and tone the entire upper-body postural muscles, arms, back, and abs. Doing the modified version gives the toddler more of an inclined angle, making it easier for them to hold on. It also helps you not arch and push from your back. Action: Sit with knees bent and feet flat and together in front of you. Place your toddler on your shins, facing you. Place your hands behind you for balance. Lift your legs and toddler up (legs parallel to the floor). Lower legs back down. Why: This move strengthens the quads, knees, core and glutes! It’s also one of the moves that induces instant giggling fits from toddlers. The result? You start laughing as well — bonus core work. Very nice topics. I visited your website first time and I like your post.